Do you know how to swim against the current? When Jesus came to earth, He brought a whole new way of thinking that challenged the religious leaders of His day. With concepts like loving your enemies, the ideas Christ presented in the Sermon on the Mount still challenge today's worldly thinking. 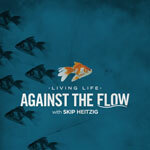 In this series, Pastor Skip Heitzig looks at what it means to be citizens of God's kingdom, covering the basic fundamentals of Christian living. As followers of Christ, we're called to live against the flow of mainstream culture: Are you ready? What Did Jesus Think About the Bible?